Pyrophosphate (PPi) is a known inhibitor of hydroxyapatite formation and has been shown to inhibit medial vascular calcification in vitamin D–toxic rats. It was demonstrated recently that endogenous production of PPi prevents calcification of rat aorta that are cultured in high concentrations of calcium and phosphate. For determining whether PPi metabolism is altered in hemodialysis patients, plasma levels and dialytic clearance of PPi were measured in stable hemodialysis patients. Predialysis plasma [PPi] was 2.26 ± 0.19 μM in 38 clinically stable hemodialysis patients compared with 3.26 ± 0.17 in 36 normal subjects (P < 0.01). Approximately 30% of plasma PPi was protein bound, and this was not altered in dialysis patients. There was a weak inverse correlation with age in normal individuals but not in dialysis patients. Plasma [PPi] in dialysis patients was correlated with plasma [PO43−] (r = 0.56) but not with [Ca2+], parathyroid hormone, or the dose of dialysis, and levels did not vary between interdialytic periods of 2 and 3 d. Plasma [PPi] decreased 32 ± 5% after standard hemodialysis in 17 patients. In vitro clearance of PPi by a 2.1-m2 cellulose acetate dialyzer was 36%, and the mean PPi removal in five patients was 43 ± 5 μmol, consistent with a similar in vivo clearance. Cleared PPi was greater than the plasma pool but less than the estimated extracellular fluid pool. Erythrocyte PPi content decreased 24 ± 4%, indicating that intracellular PPi is removed as well. It is concluded that plasma [PPi] is reduced in hemodialysis patients and that PPi is cleared by dialysis. Plasma levels in some patients were below those that have previously been shown to prevent calcification of vessels in culture, suggesting that altered PPi metabolism could contribute to vascular calcification in hemodialysis patients. Vascular calcification is a common occurrence in patients with ESRD that is receiving increased attention. This calcification occurs in the media of large and small arteries in the matrix between smooth muscle cells (1) and is also known as Monckeberg’s arteriosclerosis. It is an entirely different process than intimal calcification (2,3), which is associated with atherosclerosis and may also be present in these patients (4). Clinical practice to prevent medial vascular calcification in ESRD is based on the assumption that it is merely a manifestation of plasma concentrations of Ca2+ and PO43− that are above the solubility product for Ca3(PO4)2. Although serum phosphate levels and the product of serum calcium and phosphate levels correlate with cardiac mortality in ESRD (5), abundant data indicate that this is not the entire explanation. Medial calcification is commonly seen in diabetes and with aging and occurs in several genetic defects, all in the presence of normal plasma calcium and phosphate concentrations (6–9). These observations suggest that calcification can occur at normal concentrations of calcium and phosphate and that mechanisms are normally in place to inhibit this. Thus, vascular calcification must be considered as a failure of these mechanisms. Studies in smooth muscle cells in vitro and in genetically engineered mice have implicated several proteins as physiologic inhibitors of vascular calcification, including matrix Gla protein (9,10), osteopontin (11–13), and osteoprotegerin (8). Evidence that any of these inhibit calcification in vivo and in humans is either lacking or negative (14,15). We showed recently that rat aortas fail to calcify when cultured in very high calcium and phosphate concentrations and that this is due to an inhibitory effect of pyrophosphate produced by the vessels (16). This inhibition occurred at pyrophosphate (PPi) concentrations that are normally present in human plasma. PPi is well established as an inhibitor of calcification in cartilage and of calcium oxalate crystallization in the kidney (17,18) and inhibits vascular calcification in vitamin D–toxic rats (19). It is a direct and potent inhibitor of hydroxyapatite formation in vitro, and even the small concentrations in plasma (2 to 4 μM) are sufficient to completely prevent crystallization from saturated solutions of calcium and phosphate (17,18,20). Humans with low levels of PPi as a result of the absence of a PPi-producing enzyme develop severe, fatal arterial calcification that can be prevented by therapy with bisphosphonates (7,21), which are nonhydrolyzable analogs of PPi. These findings suggest that vascular calcification cannot occur in the presence of normal concentrations of PPi and that the medial vascular calcification in ESRD must be associated with altered PPi metabolism. PPi is normally cleared by the kidney (22), but little is known about its metabolism in renal failure other than two studies that were published >30 yr ago. Russell et al. (17) measured plasma levels of PPi in 30 patients with renal failure but provided no details about the patients, including whether they were undergoing dialysis. Levels were elevated and decreased in 15 patients who were studied before and after dialysis. Silcox and McCarty (23) found slightly elevated levels in five uremic patients, but further information on these patients was not provided. To gain a clearer picture of PPi metabolism in hemodialysis patients and the effect of current dialysis techniques, we measured plasma levels and examined dialytic clearance in a group of stable hemodialysis patients. Patients were recruited from among inpatients who were undergoing hemodialysis at Emory University Hospital (n = 23) and from a single outpatient dialysis center (n = 15) and were in their usual state of health. Inpatients consisted of patients who were undergoing evaluation for renal transplantation or undergoing procedures such as placement or correction of vascular access and coronary angiography. Normal subjects were recruited from among hospital and university staff. Subjects were not fasted before sampling. To examine the correlation between plasma [PPi] and dialysis dose or parathyroid hormone (PTH) levels, we studied an additional 33 patients from two outpatient dialysis units. PPi was measured by enzymatic assay using uridine-diphosphoglucose (UDPG) pyrophosphorylase as described by Lust and Seegmiller (24) and Cheung and Suhadolnik (25) with modifications. A sample (20 μl) was added to 100 μl of reaction buffer that contained 90 mM KCl, 5 mM MgCl2, 70 mM Tris-HCl (pH 7.60), 10 μM NADPH, 3.7 μM UDPG, 0.25 U/ml UDPG pyrophosphorylase (Type X from baker’s yeast), 2.5 U/ml phosphoglucomutase (from rabbit muscle), 0.5 U/ml glucose-6-phosphate dehydrogenase (Type XV from baker’s yeast), and 0.15 μCi/ml [14C]UDPG. After 30 min at 37°C, 200 μl of 2% activated charcoal was added on ice with occasional stirring to bind residual UDPG. After centrifugation, the radioactivity in 200 μl of supernatant was counted. Plasma and dialysate were assayed without additional preparation. For measuring erythrocyte PPi, cells were washed free of plasma and resuspended in saline. One volume of 6 M HClO4 was added to 11 vol of cell suspension and mixed well. After 30 min on ice followed by centrifugation, the supernatant was removed and returned to neutral pH with 6 M KOH. The samples were centrifuged again, and the supernatant was assayed for PPi as above. Results were normalized to the hemoglobin concentration in the original cell suspension. Serum calcium, phosphorus, albumin, urea, alkaline phosphatase, and PTH (biointact) were measured in clinical laboratories. For inpatients, the samples were clinical specimens that were obtained during the same hospitalization, usually on the day of dialysis. In outpatients, these assays are performed monthly, and the sample closest to the date of the PPi sample was used. Urea reduction ratio was obtained by dividing the serum urea concentration at the end of dialysis by the value obtained at the start of dialysis after 2 min of low flow. [32P]PPi and [14C]UDPG were obtained from Perkin-Elmer (Boston, MA). All other reagents were obtained from Sigma-Aldrich Chemicals (St. Louis, MO). Data are presented as means ± SE. Differences between means were tested with the two-tailed t test. Differences between distributions were analyzed by the χ2 test. P < 0.05 was taken as significant. It is necessary to measure PPi in plasma rather than serum because of release from platelets (23). The use of EDTA as an anticoagulant was found to interfere with the assay, whereas heparin showed no effect. After collection in heparin, PPi was stable for at least 1 h at room temperature as determined by hydrolysis of [32P]PPi. The assay was linear up to 10 μM PPi added to human plasma, but the slope varied between plasma samples. For confirming the specificity of the assay, plasma was treated with 2.0 U/ml inorganic pyrophosphatase for 1 h at room temperature before assay. Although this resulted in complete hydrolysis of PPi, as determined from added [32P]PPi, the assay still yielded positive results. The cause of this false positivity could not be identified. Because of these difficulties, three different assays were performed on each sample: (1) no additions, (2) preincubation with pyrophosphatase, and (3) addition of 5 μM PPi. The plasma [PPi] was determined as (CPM1 − CPM2)/(CPM3 − CPM1) × 5 μM. Binding of PPi to plasma proteins was determined by filtering plasma that contained [32P]PPi through 10-kD molecular weight cutoff filters (Centricon; Millipore, Billerica, MA). Protein binding was 27 ± 2.8% in normal subjects (n = 11) and 28 ± 4.7% and 33 ± 4.6% in hemodialysis patients before and after dialysis, respectively (n = 5). The characteristics of the normal subjects and hemodialysis patients are presented in Table 1. Of note is that the patients were significantly older, and a significantly greater proportion were black. The plasma PPi level in normal subjects was 3.26 ± 0.17 μM (mean ± SEM), and there were no racial or gender differences. This was consistent with previous measurements showing a mean plasma level of 3.0 μM (26). There was a weak but significant negative correlation with age (r2 = 0.11, P < 0.05) in the normal subjects but not in the dialysis patients (r2 = 0.02). Comparison of plasma [PPi] in normal subjects and in hemodialysis patients (predialysis) is shown in Table 2. The mean concentration was 31% lower in hemodialysis patients. Because the dialysis patients were significantly older as a result of an elderly subpopulation not represented in the normal subjects, data were also analyzed for age <60. As shown in Table 2, plasma [PPi] was still lower in hemodialysis patients despite that the ages were similar (47 versus 41 yr in normal subjects; NS). As shown in Figure 1, the reduced mean plasma [PPi] was due to a subset of patients with very low levels. Whereas the highest levels in the normal subjects and the hemodialysis patients were similar, 15 patients had levels below the lowest level in the normal subjects. The effect of other parameters on plasma [PPi] in hemodialysis patients is shown in Table 3. Levels were lower in outpatients than in inpatients, but the difference was not statistically significant. The interdialytic period also did not influence plasma PPi concentration. One patient was studied 4 d after dialysis and was not included. The level in this patient was 3.03 μM. Plasma pyrophosphate (PPi) concentrations in normal subjects (n = 36) and in hemodialysis patients before dialysis (n = 38). Bars indicate means. Fasting serum chemistries were available only for the inpatients. Serum phosphorus ranged from 1.9 to 8.7 mg/dl with a mean of 4.9 ± 0.4 mg/dl (n = 21) and, as shown in Figure 2, correlated positively with plasma [PPi] (r2 = 0.31, P < 0.01). Total serum [Ca] was 8.9 ± 0.2 mg/dl with a range of 7.2 to 10.7 mg/dl (n = 30) and did not correlate with plasma [PPi] (r2 = 0.00). There was also no correlation when serum [Ca] was corrected for the level of serum albumin. Alkaline phosphatase activity ranged from 42 to 326 with a mean of 120 ± 18 (n = 21) and did not correlate with plasma [PPi] (r2 = 0.02). Serum [PTH] and urea reduction ratio were available only in outpatients. [PTH] ranged from 6 to 805 with a mean of 239 ± 24 and was not correlated with plasma [PPi] (r2 = 0.047). The urea reduction ratio was 0.72 ± 0.01 with a range of 0.42 to 0.84 and also did not correlate with plasma [PPi] (r2 = 0.00). 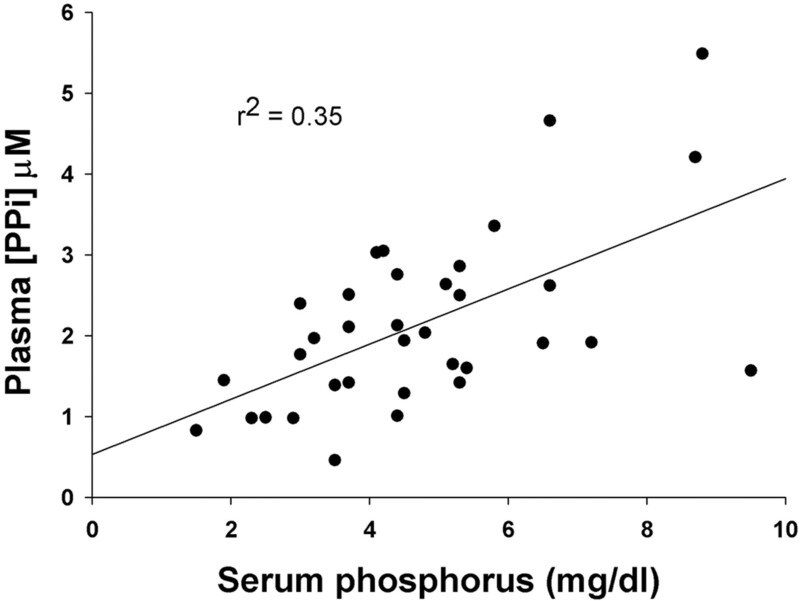 Correlation between serum phosphorus and plasma PPi levels in 35 hemodialysis patients. Several studies were undertaken to determine the extent of PPi removal with dialysis. In vitro PPi clearance was determined by dialyzing a 4-L solution of PPi in physiologic saline at a flow of 400 ml/min against a standard clinical dialysate without calcium (to prevent precipitation of PPi) at a flow of 800 ml/min using a 2.1-m2 cellulose acetate membrane. As shown in Figure 3, the disappearance of PPi fit a single exponential function and revealed a dialyzer clearance of 36%. In 17 patients, some of whom were included in the predialysis data, plasma PPi concentration was measured before and after dialysis (Figure 4). The level decreased in all but one patient with a mean decrease of 32 ± 4.7% (P < 0.001), but the range was large (4 to 59%, excluding the one patient in whom there was an increase). 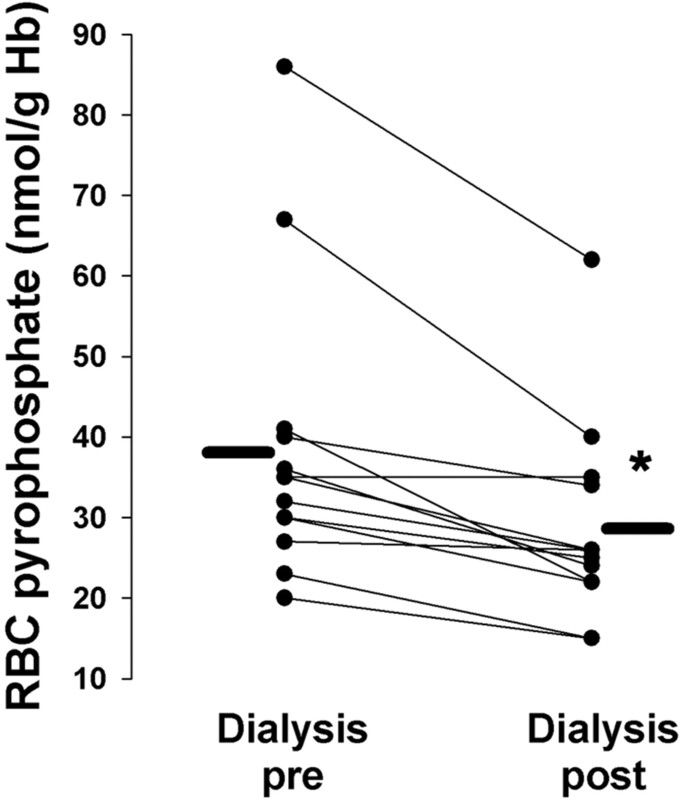 Dialysis decreased erythrocyte PPi content in 12 of 13 patients, with the level unchanged in the other patient (Figure 5). The mean decrease was 24 ± 3.7% (P < 0.001). Dialysate was collected during four treatments in four different patients to measure the total amount of PPi removed. The total amounts cleared in these treatments were (in μmol) 42, 42, 32, and 57. The mean value was 43 ± 5 μmol. In vitro dialysis of PPi. A 4-L solution of PPi in physiologic saline solution without calcium was circulated through a 2.1-m2 cellulose acetate dialyzer at 400 ml/min against a standard clinical bath without calcium. The concentration of PPi was measured at the times indicated. The line represents a single exponential fit. Change in plasma PPi concentration after hemodialysis. Samples were drawn immediately before and immediately after dialysis from the predialyzer tubing. 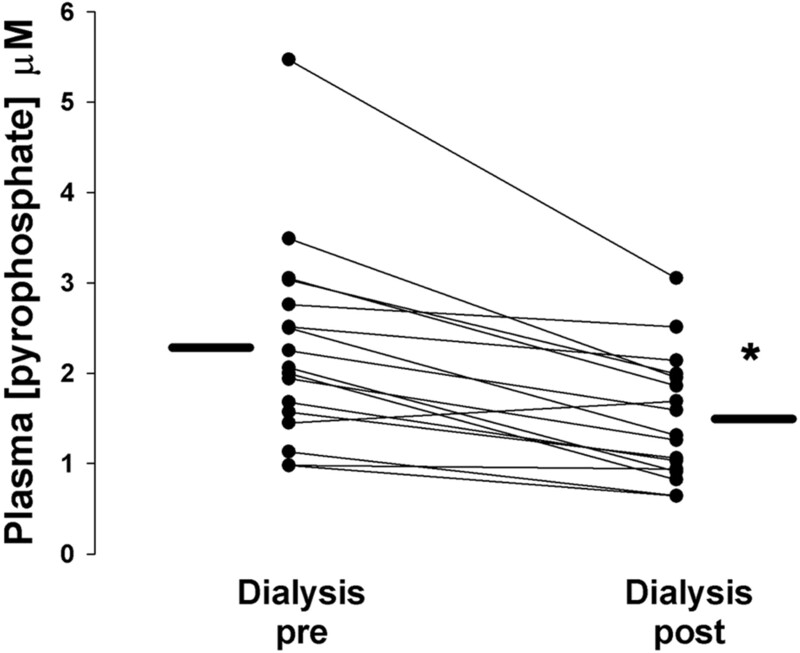 The lines to the left and right indicate the mean values before and after dialysis, respectively. *P < 0.001. Change in erythrocyte PPi content after hemodialysis. Plasma samples were drawn immediately before and immediately after dialysis from the predialyzer tubing, and washed erythrocytes were extracted with HClO4 as described in Materials and Methods. The lines to the left and right indicate the mean values before and after dialysis, respectively. *P < 0.001. Despite that PPi is normally cleared by the kidney (22), plasma levels were reduced in hemodialysis patients. Further compounding the reduced plasma [PPi] is its clearance by dialysis, resulting in an additional 32% decrease. Thus, at the end of dialysis, levels were approximately half the normal level. The finding of reduced plasma [PPi] differs from the increased levels observed in two small studies that were published >30 yr ago (17,23). This discrepancy may be due to the different assays used or to better clearance of PPi with modern dialysis techniques, although dialytic clearance was demonstrated in one of these studies (17). Very little is known about extracellular PPi metabolism. PPi is the byproduct of approximately a dozen intracellular enzymatic reactions (21), primarily involving nucleotides. There does not appear to be an enzyme whose sole purpose is to produce PPi. Because PPi is a charged molecule that cannot diffuse across the plasma membrane, specific pathways for its disposal exist. One is hydrolysis by cytoplasmic phosphatases such as inorganic pyrophosphatase, and another is transport out of the cell (21). The recently cloned anion transporter ANK may be the responsible for this efflux (27). Absence of the ANK protein in mice leads to extensive ectopic calcification, although not of vessels, and cultures of cells from these mice have reduced PPi levels in the medium (27). PPi is also produced extracellularly from ATP by membrane-bound ectonucleotide pyrophosphatase/phosphodiesterases (28–30). Deficiency of one of these enzymes in humans, PC-1, markedly reduces plasma PPi levels and results in extensive vascular calcification known as idiopathic infantile arterial calcification (7). PPi can be hydrolyzed by extracellular phosphatases, most notably alkaline phosphatase. Deficiency of alkaline phosphatase (hypophosphatasia) increases plasma PPi concentration (22) and impairs skeletal calcification (31). Although plasma PPi was not correlated with serum alkaline phosphatase activity in the dialysis patients, circulating levels of this enzyme may not reflect its hydrolysis of PPi within tissues. It is of interest that serum alkaline phosphatase activity is increased in patients with calcific uremic arteriolopathy (calciphylaxis) (32). The mechanism of the reduced PPi levels in hemodialysis patients is unknown but probably cannot be explained solely by dialytic clearance. Data on the dynamics of plasma PPi are very limited and come from a single study of intravenously administered PPi in dogs (33). The decay of [32P]PPi in dogs revealed two pools: A rapidly turning over pool with a size consistent with plasma and a slower pool with a minimum estimated size consistent with extravascular, extracellular fluid and a maximal size indicating some tissue binding but too small to include bone PPi (33). 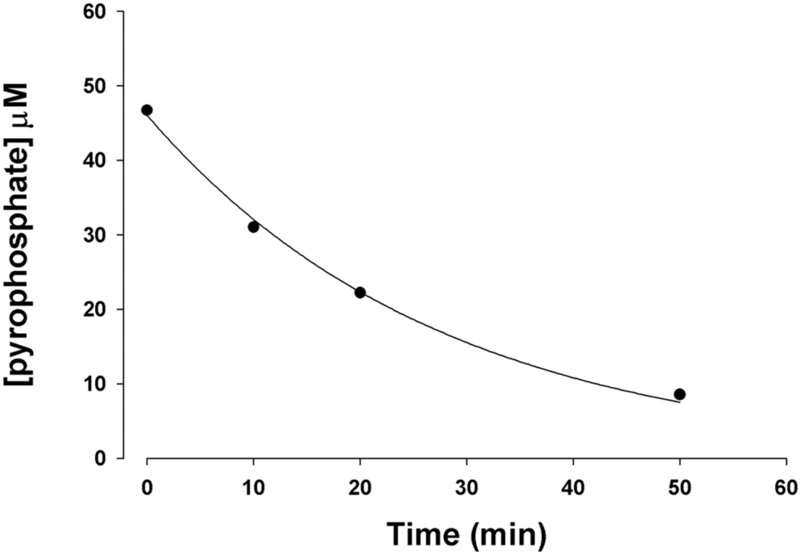 Plasma clearance in dogs was 15 ml/kg per min, and renal clearance was 0.9 to 2.1 ml/kg per min. Thus, renal clearance accounts for only a small fraction of total plasma clearance. On the basis of the amount of PPi removed during dialysis (43 μmol), a dialysis time of 210 min, and assuming an average plasma [PPi] during dialysis of 2 μM (30% of which is bound), dialytic clearance was 146 ml/min, or approximately 2 ml/kg per min. Of note, this corresponds very closely to the 36% dialyzer clearance measured in vitro. Thus, dialytic clearance of PPi is the upper range of normal renal clearance in dogs (33) but, averaged over the interdialytic period, is far less than normal renal clearance and would not be expected to reduce plasma [PPi] compared with normal subjects. Furthermore, if the reduced levels are due to dialytic clearance, then there should be a progressive increase during the interdialytic period. Although this was not measured directly, there was no difference in the mean predialysis plasma levels between patients who were studied 2 and 3 d after dialysis. This suggests that the reduced plasma levels are due either to decreased PPi synthesis or to increased nondialytic, extrarenal clearance. The lack of correlation with the urea reduction ratio is also consistent with a mechanism other than dialytic clearance and also suggests that the mechanism is not related to the dose of dialysis. The PPi levels in dialysis patients did not correlate with serum [Ca] or PTH and were positively, rather than negatively, correlated with serum [PO43−]. Thus, PPi deficiency does not seem to be explained by the altered mineral metabolism in ESRD patients. However, we cannot rule out an effect of 1,25(OH)2 vitamin D3. A positive correlation between plasma phosphate and PPi concentrations was described previously in humans (23), and there is a close correlation between phosphate ingestion and urinary PPi excretion (34). These data indicate that PPi production is linked to phosphate availability even though there is no direct conversion of phosphate to PPi. Such a link could allow PPi to protect against the calcifying effect of hyperphosphatemia. The reduced PPi levels in hemodialysis patients despite their hyperphosphatemia suggests a failure of this mechanism and an even greater PPi deficiency. The reduced PPi levels in hemodialysis patients and the further decrease during dialysis have important implications because PPi is a potent inhibitor of hydroxyapatite crystallization (17,35). The concentration in normal plasma [PPi] prevents crystallization from supersaturated solutions of calcium and phosphate, and we showed previously that this concentration also prevents calcification of rat aortas in culture (16). Thus, the reduced levels in hemodialysis patients could promote hydroxyapatite formation. Because 30% of the PPi is protein bound, free levels are even lower, but it is not known whether protein-bound PPi can also inhibit calcification. It is likely that PPi levels within the arterial wall rather than in plasma are important in inhibiting vascular calcification. Although we cannot extrapolate from plasma levels to tissue levels, our data indicate that PPi metabolism is not normal in hemodialysis patients. Furthermore, the data in erythrocytes demonstrate that dialysis can affect intracellular levels as well. Because PPi production is probably low in these cells and they are in direct contact with plasma, the results may not be applicable to other tissues. It is of interest that administration of PPi to vitamin D–toxic rats inhibits vascular calcification (19), suggesting that PPi deficiency may be causative. However, it is likely that other factors, such as hyperphosphatemia, also play an important role in vascular calcification. Additional studies will be necessary to determine whether correction of the PPi deficiency in hemodialysis patients will reduce vascular calcification. This study was supported by grants from the National Institutes of Health (RO1HL47449), the Genzyme Corporation, and the Genzyme Renal Innovations Program.